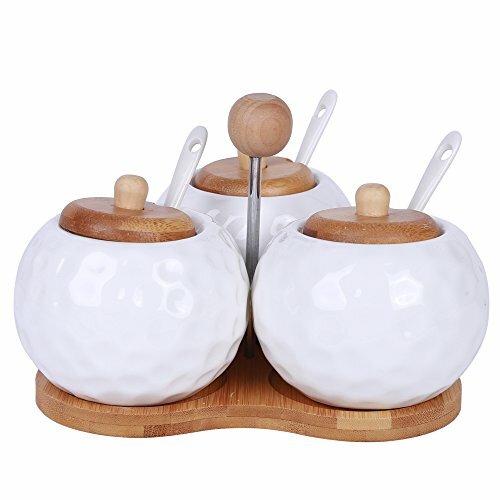 Modern Elegant 3 Piece Ceramic Condiment Cups Pot Jars Set With Spoons and Holder - For Chutney Jelly Sugar Powder Creamer Server. PACKAGE DIMENSIONS: L 10" H 4" W 10". DESIGN: The natural appearance of the natural bamboo lids and tray blends beautifully with the color of the canisters. Adds a touch of clean elegant style to your modern home. FUNCTIONAL: Comes with a portable holder to carry with ease from the kitchen to the dining table - saves counter space! Includes matching spoons - Great pantry organizer. GIFTS: Makes a great housewarming gift to complete any kitchen set. FOOD STORAGE: Many food storage uses! Great as a cookie jar, sugar glass jar, sugar container, flour containers, and condiment storage. XENA BRANDS: Brings you a variety of gifts for the family and home - for your kitchen and more. From housewarming gifts to dorms to gifts for friends and family, Xena Brands has an assortment of home essentials for every occasion. This cute ceramic condiment pot set is sure to add a homey touch to any place and save you kitchen storage. DESIGN: The natural appearance of the natural bamboo lids and tray blends beautifully with the color of the canisters. Adds a touch of clean elegant style to your modern home. FUNCTIONAL: Comes with a portable holder to carry with ease from the kitchen to the dining table - saves counter space! Includes matching spoons - Great pantry organizer. GIFTS: Makes a great housewarming gift to complete any kitchen set. FOOD STORAGE: Many food storage uses! Great as a sugar glass jar sugar container, salsa condiments, spices containers, and condiment storage. View More In Condiment Pots. If you have any questions about this product by Xena, contact us by completing and submitting the form below. If you are looking for a specif part number, please include it with your message.